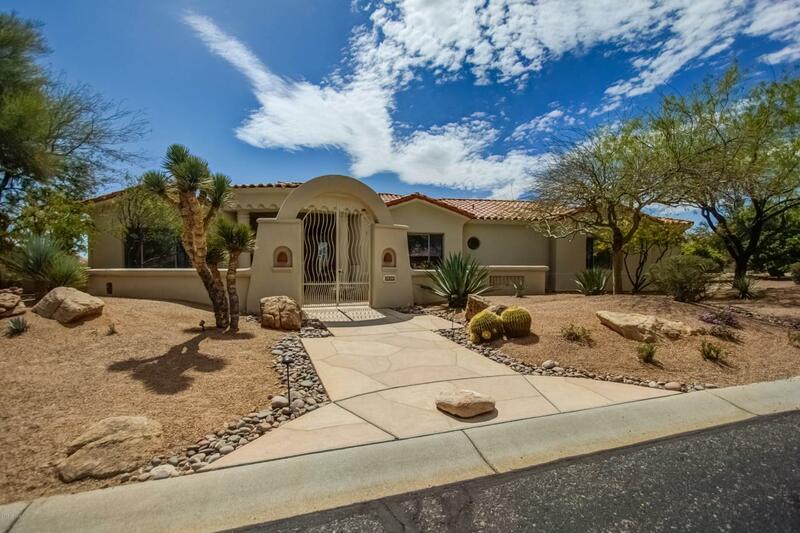 Spanish style home on 1/2 acre lot with north/south exposure. Large great room with see-thru gas fireplace, and formal dining off great room. Spacious kitchen w/center island, Stonenet counters and casual dining space. Large pantry with garage access. Master bedroom with fireplace, walkin closet,sitting area and patio access. Den/Bedroom with 3/4 bath, large utility room with sink. Private Guest Bedroom with 3/4 bath/walk-in shower. Special features include Surround Sound, Graphic Eye lighting,Central Vac, 8 ft. doors, and Anderson windows. CASITA with 3/4 bath for guests/office/or hobby room. Take in the 360 degree view from the upper deck! 5 varieties of fruit trees on this large lot. Spacious patio with heated spa. Home sits behind the 13th tee of the Peaks Course on a quiet street. Cross Street Tonto Verde Dr And Agua Verde Dr.